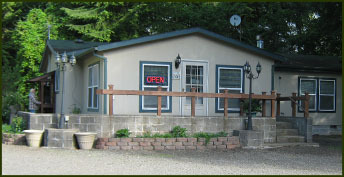 We take the quality of your stay at our RV Park and Campground seriously. In an effort to allow everyone to feel welcome, Camper Cove RV Park & Campground asks campers to follow a set of rules during your stay. We thank you in advance for your willingness to do so. It makes our park a better place to stay. Quiet times in the park are between 10:00 p.m. - 8:00 a.m. Quiet conversation around the campfire is welcome as long as you are not disturbing other guests. Early risers are asked to be considerate of the other guest who are still sleeping and keep your activities to a minimum. Please use the trash cans and dumpsters provided throughout the campground. Do not keep trash of any kind on your site overnight. We have an abundance of wildlife in our area that could not only make a mess, but harm themselves or others by getting into your trash. Do not throw trash of any kind or pour liquid in the creek. Generators are not to be used in the RV park and campground area. In an emergency of an extended power outage, Park Staff may approve use for RVs or RV Park Facilities. Please supervise your children. With both the highway and creek flowing through the campground, safety is very important to us. Do not allow your children to cross the highway without an adult. Also, always have an adult with your children when they are playing in or near the creek. 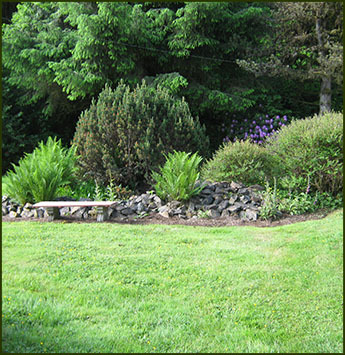 We work very hard to keep our landscaping beautiful for our guests. Therefore, we ask they do not climb the trees or play in the flower gardens and bushes. During extreme dry conditions open fires may not be allowed. Please confirm with office before having open fires at site during dry conditions. Only wood and paper should be burned in the fire pits. We have wood available for sale at the office. Do not cut or break branches from trees or bushes in the Park. Small hatchets to chop kindling are welcome, but large axes or chain saws are not allowed due to safety concerns. Do not move fire pits. Please leave the tables in the same location and condition as you find them. If you find one damaged upon your arrival please notify Park Staff immediately so that it can be repaired or replaced as needed. Chemical toilets are provided throughout the RV Park and Campground and flush toilets are alongside the laundry room on the Cove side of the highway. Please keep all of the restrooms clean and free of trash. All used toilet paper is to be disposed of in the toilet and feminine products should be wrapped and put in a proper trash can. Showers are provided by the laundry room. Please be courteous of others and limit yourself to 10 minutes so that the hot water can be shared with all guests. Quarters for the showers are available to be purchased at the Park Office. The Office is open from 9:00 a.m. - 5:00 p.m. Monday thru Friday and 9:00 a.m. to 6 p.m. Saturday and Sunday. Please plan accordingly. Guests bringing pets with them will be asked to sign a Pet Policy when registering. Please remember those policies are for the comfort and safety of all guests and your pet. Pets are limited to two per site. Pets are to be leashed at all times and cannot be left unattended. Any pet showing aggressive behavior must leave the park. Additionally, we ask you to clean up after your pets.